The Uttarakhand Subordinate Staff Selection Commission is going to recruit a total of 807 vacancies in Group C of various departments namely, Panchayat Raj Department, Rural Works Department, Forest Department, Public Works Department and other departments. 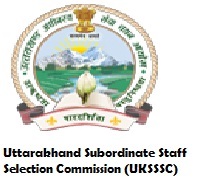 Interested and eligible candidates are invited by the Uttarakhand Subordinate Staff Selection Commission to apply for this recruitment through online. The candidates can apply from 26th November 2015 to 28th December 2015. The application form will be available in the official website www.sssc.uk.gov.in. The application fee for General category candidates are Rs.300/- and for SC/ST/PWD category candidates are Rs.150/-. The candidates will be selected based on the performance in their Written Test and Personal Interview. Fill up the form correctly. Download it and take a print copy.